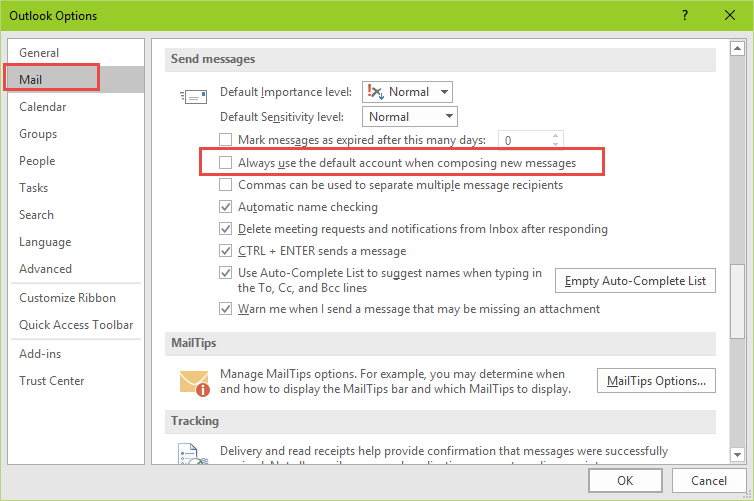 Update: Beginning with Outlook 2010 SP1, Mailto's will use the default account for messages. In Microsoft Outlook 2010 or Outlook 2013, if you configure your Outlook profile to connect to multiple Internet email accounts, an email message may be sent from an account other than the default sending account. This happens because Outlook determines the sending account based on the currently selected data store when a new mail message is created. This change effectively ignores the default sending account setting. When you use Microsoft Outlook 2010 or Outlook 2013 and have multiple accounts delivered to different *.pst files, Outlook doesn't use the default account set in Account settings for new messages. Instead, it uses the account associated with the mailbox or *.pst file you have in focus. This change in behavior takes some getting used to, but its my experience that once they understand how it works, most users with multiple POP3 or Exchange accounts like it. This feature not as well liked by users with an IMAP account as their primary account and POP3 accounts delivered to the default *.pst file. Instead of using the default IMAP account as it did in previous versions, Outlook now sends new mail using a POP3 account that is delivered to the *.pst. When the IMAP user sends a new message to a contact or starts a new message after viewing the calendar, Outlook chooses a POP3 account as the sending account. The obvious solution is to use a different *.pst file for the POP3 accounts but if that is not acceptable, you can set a registry value to always use the default account, regardless of the data store, or to always ask which account to use. Both of these options are controlled by a registry key. Alternately, you can use a macro to always open a new message with the default account selected or open a new message with a specific account selected. Out of the box, Outlook 2010 SP1 and Outlook 2013 use the default account for Send to commands but not for new messages created while viewing a pst file (when a POP account is assigned to the pst file), unless you set a registry value to always force the use of the default account. This might be good for people who use multiple accounts and frequently (accidentally) send using the wrong account, especially if they are sending sensitive documents, as it will almost eliminate accidentally sending email from the wrong account. Notes: You need to create the path if it does not exist. You can also set this using the Office group policy templates. The value type is the same for both 32-bit and 64-bit Outlook. TechNet discussion forum: Default account setting in Outlook 2010 does not work when composing new messages? Microsoft - listen up! you can fix this easily. The issue is NOT the default account or which account one is currently viewing! The issue is that anyone using multiple email accounts in Outlook will eventually compose and send one using the wrong account - period. It's embarrassing, can cause huge legal problems and its unnecessary as it can easily be fixed intelligently! There is only one accurate solution to permanently avoid this issue: Allow association of email accounts with a specific contact entry. Meaning, anytime you create a contact in Outlook you have the option to identify/tag it with the email account that should be used when adding this contact to a new email - Done! In case someone sends an email to multiple contacts who have been associated with different Outlook email accounts, simply do a pop up that states that recipients have been tagged with different accounts and which one to use. Hi, May I trouble you for a spot of help? I wish to FORCE account selection with new emails. I recently set up a new computer running Windows 10 running with Office 365 32-bit...which in my understanding is VERY similar to Office 2016. I've attached a screen snip to illustrate. I have stumbled on an oddity which may be related to this. Email template created by somebody outside the organisation but supplied to us as part of a software product. If I use the template to send an email the although it uses my correct sending account it displays in my sent folder (I have the "email account" field visible in the sent items folder) as having been sent using an account from outside our organisation?? Seems really odd. How can I be sure the outside email account is not somehow also receiving a copy? I'm surprised the From field shows another address - it definitely shouldn't. Do you see the From field when you create a message using the template? If not, look on the Options menu and show the From field. Make sure you account is listed there. Also, i would test using it to send to a personal account. If you use exchange it definitely should use the correct From account but some SMTP servers will accept mail with a different From address. >> template it is populated with the default email account field from the computer on which it is created. Hadn't thought about that possibility - I'll have to test that by sending to a personal account and see how it shows up on a home device. Issue though with wrong EmailAccount showing in the Sent folder happened again today when I used a .msg template I thought I had re-created (but hadn't ) . Easiest way I have found to determine what account is "baked into" a saved .msg file is through the design this form option on the Developers tab in Outlook 2016 . Unfortunately the field is not editable. I have several e-mail accounts. When I reply, Outlook (2016) many times but I think not always chooses the default account as From instead of the one the e-mail was sent to. This is annoying and I am ready to give Outlook the boot. So far I could not find a simple solution for this. Is there one? Are the messages all delivered to the same mailbox on the server but downloaded using different accounts set up in Outlook? That is the usual reason for this behavior. is there a way outlook shows 2 accounts on the startup? You can open two outlook windows, one to each account - that would be the only way. Right click on the second folder, choose open in new window. When you close outlook, use File, Exit. When you start outlook, both windows will open. I do have a specific requirement which is close to the above, but not quite answered by your useful guidance: I have different data files which I would like to assign a specific email account to. The email accounts are all working fine, and I have a default email account set up BUT I'd prefer not to have to select each time on the other. So is it somehow possible to assign a different default email to each outlook data file ? Thanks. MAC to achieve the same as we don't have registry in MAC? 2 Outlook .com etc, 3 PoP or IMAP. 4 Other. pop or imap for all accounts except Outlook.com, office 365, or Exchange server.